This forum offers an opportunity to interact and discuss with the SynsCOP-15 modeling team. To access the forum, you must be registered. If it is not the case, please send a request by e-mail to contact at ordecsys dot com with the title "synscop15 forum registration". General: contains the discussions concerning the topics of SynsCOP-15 and the information request about the use of this internet site. 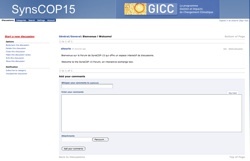 COP-15: contains discussions concerning the negotiations of COP-15 (Copenhaguen) and their results. 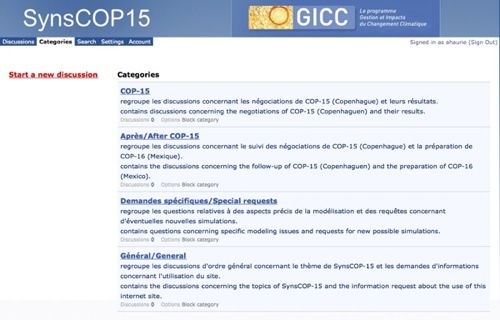 After COP-15: contains the discussions concerning the follow-up of COP-15 (Copenhaguen) and the preparation of COP-16 (Mexico). Special requests: contains questions concerning specific modeling issues and requests for new possible simulations. Discussions : contains all the discussions you have access to. Categories : allows a direct access to a discussion in a given category. Search : permits you to find a category, discussion or user from key words. Account : permits you to modify your password and personal informations.